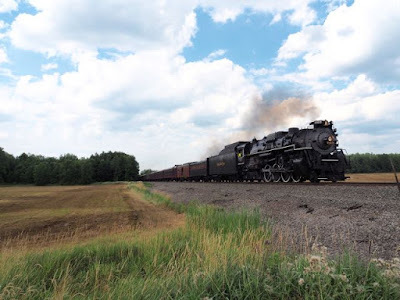 I spent Saturday afternoon, July 25, 2015, chasing the NKP 765 excursion from Ashtabula to Youngstown. 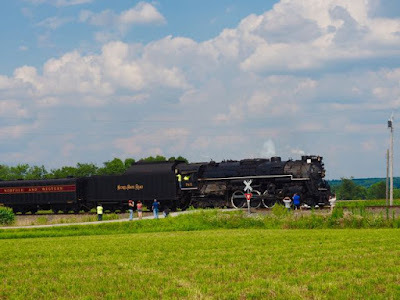 I did not ride it even though I need the approximately 5 miles from I90 to the NKP connection (I got from there south on the Good Morning America Train in 2008). 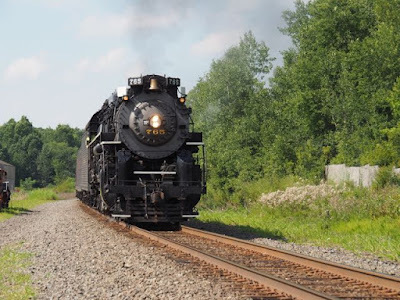 I had planned to chase the train south and then meet Steve Miller (who was riding) at Youngstown and go see the Mahoning Scrappers (Cleveland, Short Season A) play the Brooklyn Cyclones. Then I suggested to Steve that he join me chasing back once he had the mileage and that is what we did. 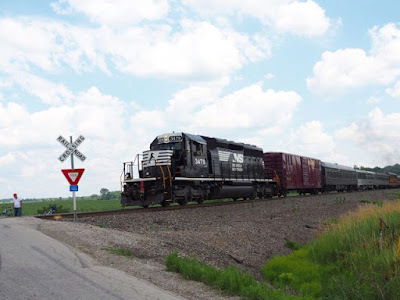 I left home around 11am and hit Boardman, OH at almost exactly noon. Along the road I saw a highway sign for a Steak and Shake and decided to stop for a take-out lunch. While I was waiting for my order, I heard someone behind me call my name. 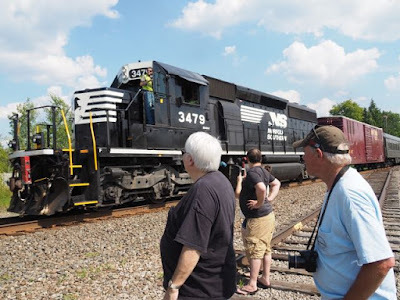 It was a friend and his wife from the Boston area who were also out to see the train. They had just driven up from the Pittsburgh airport and had stopped to dine at an old reliable. 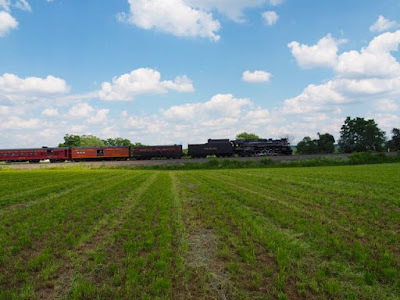 I made some suggestions for where they could see the train along the way (they are riding tomorrow) and then left them to head up to Ashtabula. I reached Ashtabula by 1:30 but had some trouble finding the train. I reached trainside at about 2:15 … a few minutes ahead of its scheduled 2:30 departure. I had spent some time on Friday mapping out where each road crossing of the line was on Pocket Earth (a great GPS application for the iPhone and I presume Android) and then used the information in Google Earth and eventually Google Streetview to see what each crossing looked like. I was able to identify 14 likely locations between Ashtabula and Youngstown and about 6 nice ones. I had preprogrammed all of them into my GPS. We went to four of them. Dorset was the first of the nice ones. When we got there (next to a manure farm as far as I could tell) there were two youngish fans there already, and shortly we were joined by pair of daisy pickers, shown below. We had a long wait for the train but eventually he showed--just as the sun went behind a cloud. Even Steve, who rode, was surprised by the trailing unit. The line from Youngstown to Ashtabula has essentially no curves and since NS doesn’t let people open dutch doors and there are no runbys…. The next stop was at Kinsman, about 9 miles further towards Youngstown. 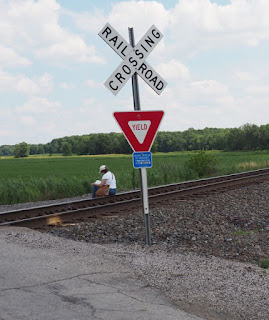 We got there, out of my car, and in position, just ahead of the train. Then it was on to a spot at the 84 Lumber on the Warren-Sharon road where again we arrived just minutes ahead of the train. Our final photo location was on Hubbard Rd, in Youngstown. Again we had little time to wait after we arrived. This would have been a better shot without the jerk with the head lights. As my friend Alex Mayes pointed out (and illustrated by the below) with digital photography it really isn't a problem! 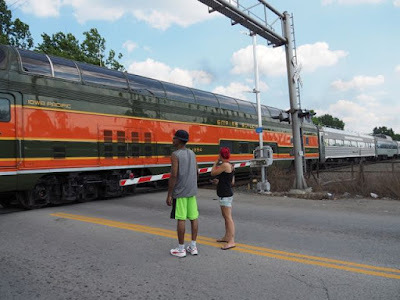 One final shot at Hubbard shows a young couple admiring the train and one of Iowa Pacific Holding's dome cars as the train passes. 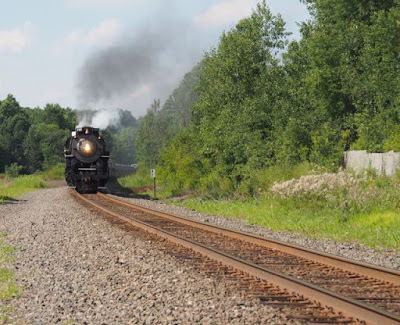 After the train reached Youngstown we said hello to a couple of friends who had ridden and then Steve and I headed to the ball park, Eastwood Field, in Niles. Eastwood Field is a very nice minor league park, nicer than most of the current cookie cutter parks. The food was decent and decently priced. The play was definitely single A but enjoyable never the less. Because I had a 90+ minute drive home I left after the 5th inning. There are several things in my life that I have avoided at a younger age that I've tried again as an adult. For instance as a child I tried and disliked oysters...now I go out of my way to eat them. Or, when I was dating Barbara, we went to Kennywood (a local amusement park) and I mentioned that I did not "do" roller coasters because they scared me when I was a kid. She suggested that I might find it fun now and cajoled me onto "The Racer". (I mean, I was dating her, how could I not?) She spent the ride hugging me (not a bad thing) and I still got off the ride shaking and thinking I was going to die. Likewise I had avoided propeller planes since the jet age since I tended to get very airsick on them. Years ago there was a regular service flown by Ford Tri-Motors from Port Clinton, OH to the Lake Erie Islands. Although my friend Bill Metzger took several flights at the time I never even made the trip to see them in flight because of this aversion. In subsequent years I discovered that my airsickness (at least in good weather) was more a function of age than of the engines powering the aircraft. Alas, the air service ended in 1986 and so I was resigned to not being able to add this aircraft to my list of plane types flown. On July 4th, before we left for our family picnic, I was relaxing and reading the Saturday edition of the Pittsburgh-Post Gazette when I came across an article "Care to Fly a Ford?" that said that one of the eight currently flyable Ford Tri-Motor airplanes would be visiting the area and offering rides the following weekend. I resolved to take one of the flights if the weather was clear. Why would I, a rail enthusiast, want to fly on a historic airplane? I'm actually a transportation enthusiast though I will not take long plane flights just for the sake of flying in a new aircraft. This short flight though, was not an issue. But there was another reason I wanted to fly this particular aircraft and that was because of its history. 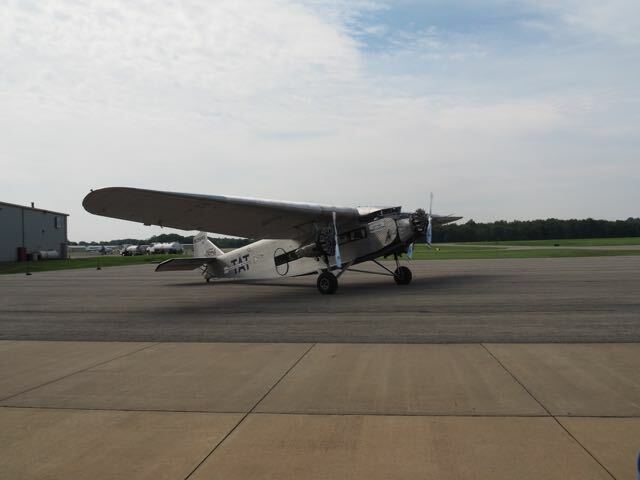 The Ford Tri-Motor had a range of 570 miles and a cruising speed of about 100mph. The distance from New York to Los Angeles is just under 3,000 miles. Best case the trip by plane would realistically require six or seven stops, and each leg would take about five hours assuming that the plane flew at cruising speed. Allowing for refueling time, etc. theoretically the trip could be done in around 45 hours of very uncomfortable flying. But in 1929 flying by night and over mountains was dangerous and so, in reality, a transcontinental air trip would require several overnight stops, perhaps doubling the time. 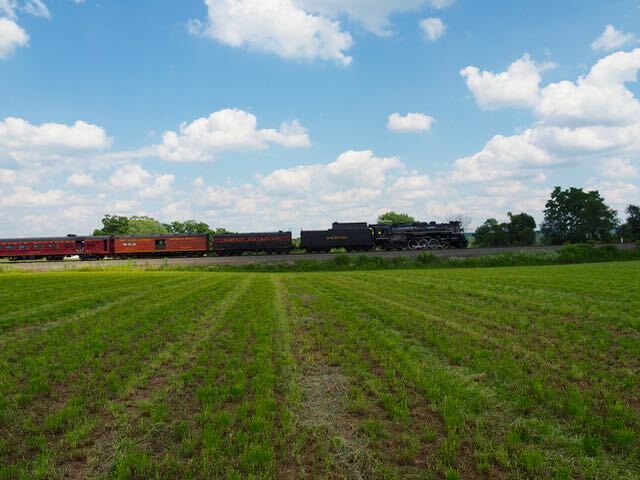 The train was a much more comfortable way to travel and night travel by train was routine. The trip required but a single stopover of several hours (usually in Chicago or St. Louis) and took roughly 100 hours. 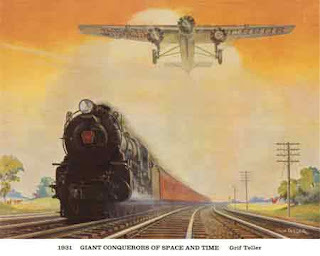 And so beginning July 7, 1929, the Pennsylvania Railroad and the Santa Fe Railway inaugurated the "Airway Express" which would leave Pennsylvania Station in New York at 6:05pm and arrive in Columbus, Ohio the next morning. 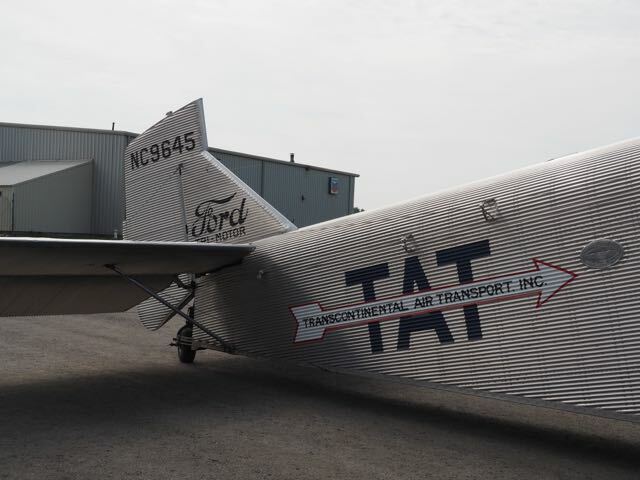 Passengers (up to 10) would transfer to the Port Columbus airport where they would find a Transcontinental Air Transport Ford Tri-Motor awaiting. (TAT was a predecessor of Trans World Airlines--TWA--or American Airlines if you're too young to remember TWA!) The plane would fly the passengers to Waynoka, Oklahoma (about 1,000 miles). That evening in Waynoka the passengers would transfer to a Santa Fe Railroad overnight train to Clovis, New Mexico. At Clovis the next morning they would transfer to another Tri-Motor which would take them the rest of the way to Los Angeles (also about 1,000 miles.) When researching the trip I discovered that the particular aircraft I was to fly was the very same one used to inaugurate the service almost exactly 86 years ago today. So it was that this Sunday morning, July 12, 2015, I arose early got dressed and started heading for Butler County Airport about 25 miles from my home in Pittsburgh. I had tried to get my daughter, Lizzy, to join me, but she elected to sleep in--her loss. Enroute to the airport I stopped for breakfast and arrived at the airport a few minutes before the 3rd flight of the day departed at around 10am. I quickly purchased a ticket for the next flight for $75 and then took pictures of the aircraft as it prepared to leave on its flight. About five minutes before the Tri-Motor returned from the previous flight the 11 passengers (one person paid extra to take the co-pilot seat before I had a chance to do so) gathered for a mandatory briefing in which we learned how to use the seat belts and where the emergency exits were and where the life jackets in case of a water landing were located (I'm not kidding about this.) 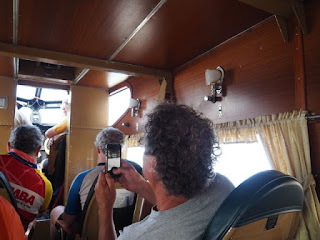 We then lined up and as soon as the passengers from the previous flight deplaned, we boarded. We each had a window and aisle seat. The first thing I noticed was that the doorway was short. It would be easy for almost anyone to bump his head on it. The second thing I noticed was that the slope of the aisle was much steeper when walking up it than it appeared from the outside. The third thing I noticed was the wood paneling and comfortable (but non-reclining) seats. And as I took said seat I noticed leg room that was greater than almost any domestic first class plane sports today. 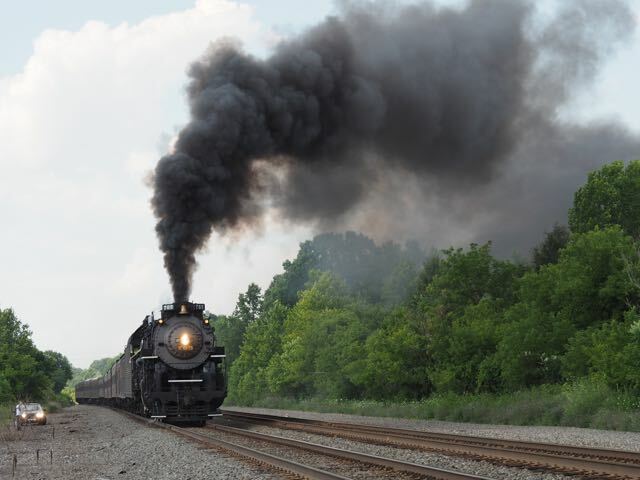 The engines started and the noise was considerable. 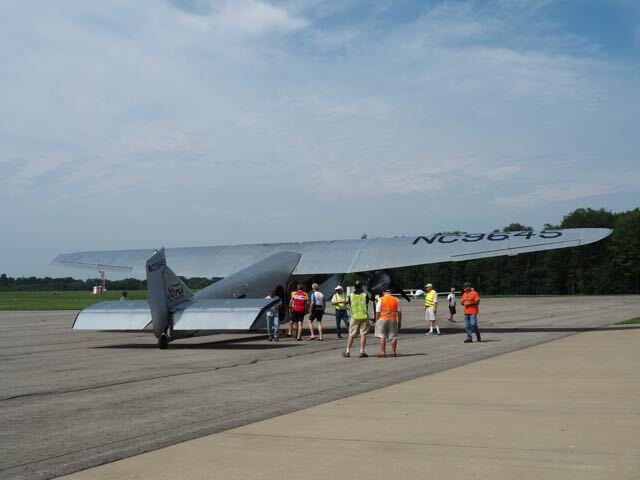 The Tri-Motor is sheathed in corrugated tin and the whole thing vibrates quite noisily. The pilot taxied to the runway and before we knew it the plane was in the air. 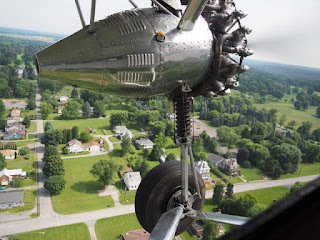 It was a beautiful day for flying and we flew a large circle north of the airport around Butler, PA before returning to the airport at 15-20 minutes later. The landing was very smooth and we were at the "gate" a few minutes later.